Exterior of the Mersey Steel and Iron Works in Liverpool. 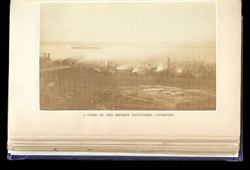 The plant is situated close to the Harrington and Toxteth Docks and is connected to the Great Northern and Manchester, Sheffield and Lincolnshire Railway Companies. Skilled employees operate puddling furnaces, plate rolling-mills, forge furnaces, great steam-hammers and powerful cranes worked by steam. The works were originated in 1810 by Ralph Clay and Mr Roscoe.